Because we're super cool, Matt, a second Matt, and I went to a Star Trek convention in San Francisco. It was basically what we expected - standard nerds, some in costume. I wanted to dress up, but Matt (both, really) was boring and flat out refused. I was planning on getting a photo signed by John de Lancie, who played Q, my second favorite Star Trek character. (For those wondering, my favorite is Garek.) The plan was to buy a picture of Q from one of the vendors. However, there were shockingly few vendors, and only one selling glossy 8x10s appropriate for signing. While mulling over the equally unideal choices, Matt noticed a picture of Terry Farrell from Trials and Tribble-ations, my second favorite Deep Space 9 episode. Anyone noticing a trend here? Anyway, I decided to get that picture as well and get it signed. Next it was time to meet Q. He was very nice - he asked some questions and listened to my answers. It was almost like a real conversation! The table next to him housed Denise Crosby, who saw my four ponies of the apocalypse t-shirt. 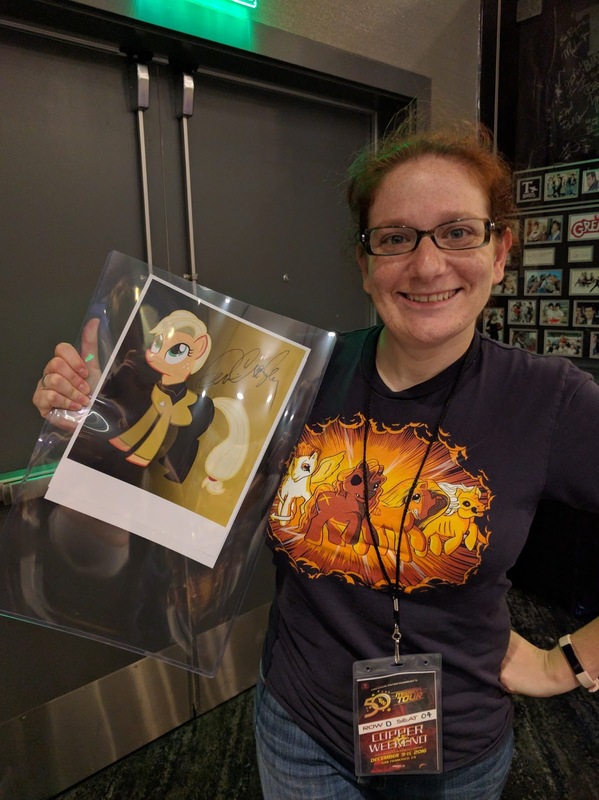 She struck up a conversation about it and told me about the Tasha Yar My Little Pony that someone made. She even looked up a picture of it on her phone! After that encounter, there was only one logical thing to do. 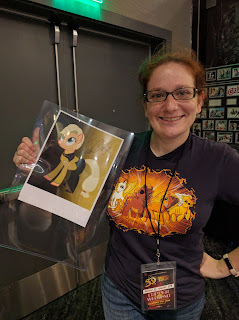 We found the hotel's business center and paid $1.90 for a crappy printout of the Tasha Yar My Little Pony. When I brought it back over and asked her to sign it, she went nuts. Good nuts, just to be clear. 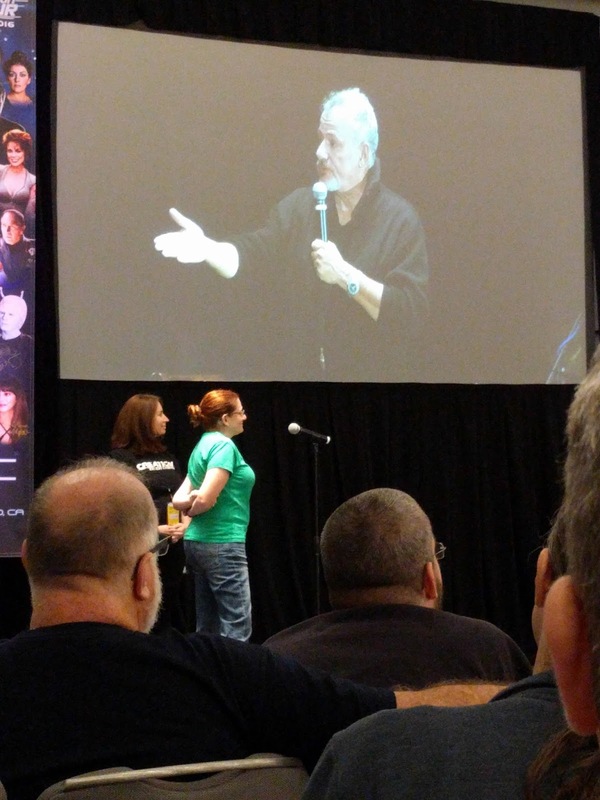 She desperately tried to get John de Lancie's attention, but he was trying to ignore her and talk to another fan. After she signed the page, I held it up over the should of the other fan's head so he'd finally see it. At first he was quite confused as to what on earth was going on that required his immediate attention, but he eventually acknowledged the pony and its inherent awesomeness. Now that such a glorious memento is in my possession, I feel the need to create a ridiculously awesome photo album in which to store it. I'm thinking of making it look like a PADD. Still basking in the glory from my successful encounters the previous day, I decided to brave the microphone and ask Q a question during his Q&A. There were two microphones, each with about five or six people waiting when I got up to the front. I patiently waited my turn as people alternated between legitimate questions and asking for validation on their creepy stalker stories and pet theories. Finally, the person in front of me asked her question. All that was standing in front of me and 15 seconds of talking in front of hundreds of people was a kid at the other mike. The kid claimed to be 13, but he looked closer 8. 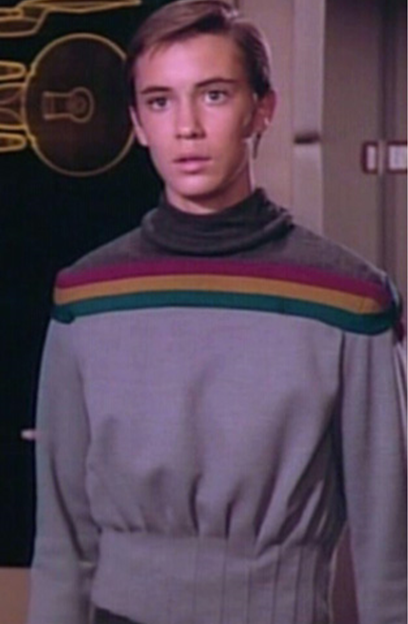 And he was dressed like Wesley Crusher, complete with the sweater. I thought to myself, "If anyone is going to ruin my amazing question, it's going to be freaking Wesley." Well, guess what happened next. While he did not ask the exact same question, it was annoyingly similar. I desperately wanted to yell, "SHUT UP WESLEY!" I even contemplated leaving the line, but I didn't want to be berated publicly by Q. I tried desperately to think of anything resembling a valid question. My idiot brain went completely blank. And then it was my turn to speak. With nothing else to say, I gave up and just asked my original question. "Which captain did you most enjoy tormenting?" To no one's surprise, he replied that he just answered that question. "I know, but after waiting in line, I at least wanted a chance to ask." And I ran off to hide at the bottom of a deep chasm. Or back to my chair, which was slightly closer. Water water everywhere. Especialy in the garage.